IF the New Year has brought with it a desire to learn something new then the launch of a new county Saturday Music School could be for you. 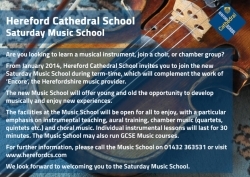 From Saturday January 18, the Hereford Cathedral School Music School will open its doors to adults and children who would like to become more involved in music-making. It will provide opportunities which complement the work of Encore – the County Music provider – operating largely from Castle Street. There will be provision for children's and adult choirs, instrumental chamber music, sight-reading, sight-singing, aural, singing and instrumental lessons. Support for GCSE and A-level music and music technology will also be available, and organisers hope to provide help with any aspect of music that individuals need. That help could include sight-singing, aural and a broader range of repertoire for those currently singing in choirs as well as help in building the right skills for those who might like to join one. The Saturday Music School will be able to call on specialist tutors as the need arises, and a limited number of instruments will be available for new students to hire in the initial stages. For pianists, lessons will be taught on any one of the 15 recently upgraded pianos in the Music Schools. When the right combination of instruments is available, there will be facilities for small scale instrumental chamber music such as string quartets, wind quintets and brass ensembles, but this will happen over time and depend on applications. Anyone interested can visit and talk with staff about the new venture between 10am and 11am on Saturday January 11, with lessons and rehearsals to start the following week. For more information and for a registration form, go to Herefordcs.com and follow the links to the Saturday Music School. Email David Evans, the school’s director of music, on devans@herefordcs.com with particular queries. For students of a school age who wish to join one of the county’s orchestras or bands, contact Encore, the county music provider which runs a large number of established groups on Saturday mornings.